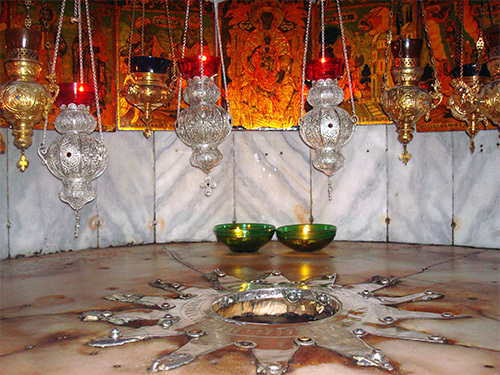 Six silver filigree vigil lamps hanging over Star of Bethlehem in Church of Nativity in Bethlehem. Vigil lamps are in apple shape with cup holder on top and reverse dome at bottom. It is consisted of 9 elements with central rosettes in the middle. Three elements have 14-pointed stars in the middle with one red garnet. Double-sided cross with one red garnet on each side is hanging at the bottom of the lamp. The silver filigree vigil lamp is suspended on 3 chains with the top rosette in shape of 14-pointed star. Situated in the center of the town of Bethlehem, The Church of the Nativity was built over the site where Jesus Christ was born in a manger. The only major surviving church in the Holy Lands from early Christian times, The Church of the Nativity was built around the 4th century A.D. Shortly after the Emperor Constantine was converted to Christianity, his mother Helena built the magnificent church, adorning it with mosaics, frescoes and marble. 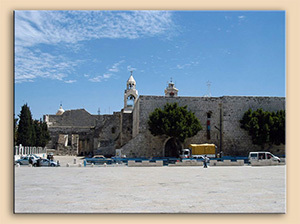 The church of the Nativity is one of the oldest church buildings of the world. Still more important is the fact that since Justinian in the early sixth century services have been held there without a break. The first durable church structure was built to the order of the emperor Constantin early in the 4th century after christianity had been established as a religion in the roman empire. The facade of the Church of the Nativity is encircled by the high walls of the three convents: the Franciscan on the northeast side, the Greek Orthodox and the Armenian Orthodox, on the southeast side. 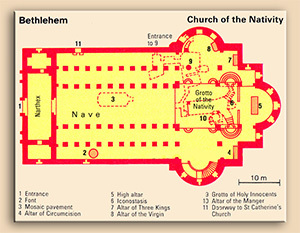 The Basilica is a rectangle 53.9m long, the nave is 26.2m wide. The Manger is situated on the north side of the Grotto, and opposite the Manger, an Alter is dedicated to the Wise Men who came to Bethlehem from the East bearing gifts to Baby Jesus. 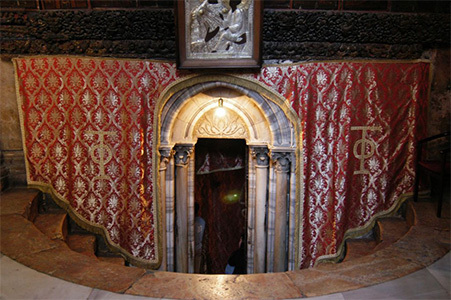 The Grotto is rectangular in shape: length is 12.3m, and the width is 3.15m. The silver Star of Bethlehem marks the place where the Virgin Mary gave birth to the Savior. The original star was destroyed during unrests in 1847. The inner circle of the star has a inscription in Latin : «Hic de Virgine Maria Jesus Christus natus est» (Virgin Mary gave birth to Jesus Christ here ). Above and around the star there are 15 silver filigree vigil lamps - 6 donated by Orthodox Greeks, 5 by Armenians and 4 by Catholics. With the blessing of H.E. 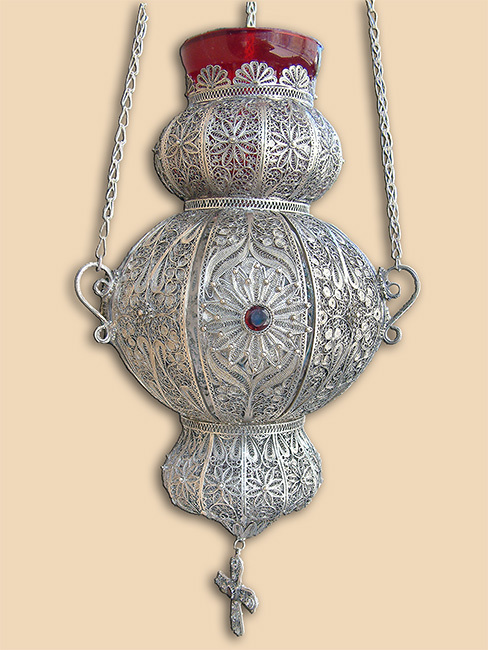 Theophylact, Archbishop of Jordan from Jerusalem Patriarchate, six old lamps were replaced with these silver filigree vigil lamps, donated by Serbian pilgrims to the Holy Land. Funds necessary for manufacturing of these six vigil lamps were collected among Serbian Orthodox believers, by efforts of Mrs. Gordana Sipka from Novi Sad and Sister Dorothea from Church of Nativity. Precious stones were donated by grace of Mr. Dusan and Mrs. Leonora Vulovic from Belgrade. Technique: filigree, granulation, stone setting, casting. Size: 24 (30) × 17 cm., chains 50 cm. Weight: KD023 -770 gr., KD024 -770 gr., KD025 -770 gr., KD026 -770 gr., KD027 -770 gr., KD028 -770 gr. Commissioned by: Mrs. Gordana Sipka, Novi Sad - Serbia. In possession of: Church of Nativity, Bethlehem - Holy Land.